“What's your religion?” said the firm, authoritative voice. The sergeant's eyes remained fixed on his clipboard waiting for my response. The Army induction center didn't seem like the place that I would be confronted with spiritual questions, but religious preference was a standard question asked of every inductee. 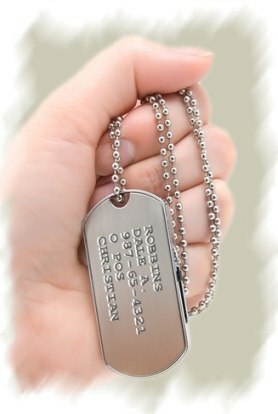 It would be stamped on my dog tags, I suppose to guide funeral services if I were killed in combat. I hesitated briefly from answering… knowing that I had not attended church for several years. But I began to think… "I must be a Christian, after all I was raised in a church-going Christian home, and I did sorta believe in God and Jesus… and definitely knew I wasn't a Muslim, Buddhist or Atheist." “Well, what is it son?” he asked again. “Well I'm, uh, Christian,” I replied meekly. But as soon as I heard the sound of my own voice, I realized my answer was hollow and lacked conviction. Sure, I held a traditional and philosophical affection toward Christianity. I believed there was a God and that Jesus was His son... and as a child I had even said my prayers and had my own Bible... however I knew inwardly that my heart was far away from God. Had I been prosecuted for being a Christian, I don't think there was enough evidence to convict me. I usually avoided thinking about such things... but was occasionally troubled, especially at the thought of what might happen when I died. Would I go to Heaven or not? I shuddered at the thought that there might be a real and literal Hell, and if so, I didn't want to go there. It took a few more years, but I eventually discovered what it actually meant to become a Christian... and to have a real and genuine relationship with Jesus as my Savior and Lord. When I did, my heart and life were transformed by this real and powerful experience with Christ. There are millions around the globe who have similar or other misunderstandings about what it means to be a Christian. Many falsely believe, as I once did, that it is just a matter of accepting the existence of God and Jesus… or acknowledging the legitimacy of Christianity and its philosophies. Others think it means to go to church, to join a denomination, to perform religious acts or abide by a set of Christian laws. While such things will likely become involved in one's relationship with God, they alone are not sufficient. There are also mistaken ideas that pool Christianity together with other philosophies... that "all religions lead to God," or other false assumptions that all everyone will go to Heaven when they die, as long as their good deeds during life outweigh the bad and so forth. Such ideas are completely false. Christianity is not simply a philosophy, history, religion… nor is it merely a matter of performing religious acts or joining a particular church. Christianity, rather, is a “spiritual experience” based on a faith relationship between you and the Lord Jesus Christ. As Jesus said to Nicodemus, “I say to you, unless one is born again, he cannot see the kingdom of God" (John 3:3,7). This “New Birth” that Jesus described to Nicodemus, is the beginning of one's Christian life that brings Salvation, a state of redemption that comes as a gift of God by faith (Eph 2:8-9). It occurs at the instant we effectively believe on Jesus Christ and confess Him as our Savior and Lord, “For with the heart one believes unto righteousness, and with the mouth confession is made unto salvation” (Romans 10:10). Jesus also described the New Birth as a conversion to infancy, explaining that new spiritual life begins like the fresh innocence of a new-born child, with a need to learn and begin to grow in new spiritual things. “Assuredly, I say to you, unless you are converted and become as little children, you will by no means enter the kingdom of heaven” (Matt 18:3). The New Birth, also refered to by theologians as “regeneration,” occurs as a result of what we often call “Saving Faith,” which means to believe in Christ, in what His life, death and resurrection did for us... “turning away from a lifestyle of sin" (repentance), and trusting Him to forgive and “save us” from the otherwise inevitable consequences of sin (Romans 6:23). We openly confess Jesus as our Savior and Lord... and we commit ourselves to follow Him, His life, teachings and example. As a result of this expression of faith, Christ comes within us bringing an inner peace of His presence and an assurance of eternal life. The New Birth is a universal, essential spiritual experience for all followers of Christ, without which it is not possible to be a Christian. As the Apostle Paul said, “if anyone does not have the Spirit of Christ, he is not His” (Romans 8:9). The birth of God's Spirit brings His life and presence into our spirit... and we are reborn, transformed, changed... by His new spiritual nature that now comes to dwells within. The Apostle Paul described the effects of the New Birth like this: “Therefore, if anyone is in Christ, he is a new creation; old things have passed away; behold, all things have become new” (2 Corinthians 5:17). “Transformation” is the greatest evidence of the New Birth. As we noted, God's Spirit is birthed in our heart... and when His presence comes within, we become different people. Our thinking becomes new and different, along with our instincts, actions and desires. We inherit God's nature... and as we continue to grow in Him, and allow ourselves to become “led” by His new Spirit within us, His characteristics will begin to bloom from our life... in the form of what the scripture calls fruit, as the Apostle Paul said “...the fruit of the Spirit is love, joy, peace, longsuffering, kindness, goodness, faithfulness, gentleness, self-control” (Gal 5:22-23). This doesn't mean that the processes and timing will be exactly the same for all new believer's. Newness and change are indeed common denominators for all new Christians. When we make a deliberate decision to turn away from sin and follow Jesus, we will experience a growing, continuing desire to please the Lord and follow His ways (as shown through His Word). However we each will respond to our new faith in individual ways, unique to our own personality, and according the the Lord's separate plan for our life. What if there is no immediate change? Don't get in a hurry. The spiritual birth is immediate, but the transformation of our desires and behavior will be progressive thing... as we grow and submit ourselves to the Lord. Fruit is something that takes times to produce. We don't expect apples, pears, grapes or other tasty fruits to suddenly appear overnight. Other than the obvious profession of faith that a new Christian makes known by openly confessing Christ as their Savior and Lord (Matt 10:32-33) and being baptized in water (Acts 2:38), it might take a bit of time for friends or family to notice other substantial differences. The most noticeable immediate change will be to the new believer. If we indeed have genuinely decided to turn away from sin, to believe in and follow Jesus as our Lord and Savior, the birth of the Spirit will produce an awareness of newness in our heart… an inner “knowing” or a sense of “assurance” that salvation has occurred. “The Spirit Himself bears witness with our spirit that we are children of God” (Romans 8:16). So… will all Christians experience this New Birth? YES! To become a Christian REQUIRES the New Birth. It doesn't matter whether a person is a Baptist, Methodist, Presbyterian, Episcopalian, Catholic, Pentecostal or anything else. The New Birth is not an option, nor a mere denominational distinctive... but rather is the universal means by which any person may become a Christian. Jesus himself said, "You must be born again" (John 3:7). In other words, the New Birth is the starting point, the entry level to Christianity. It is necessary to become saved (John 3:5)... or to become a “bone fide” Christian. Christians Who Have Not Been Born Again? A strange fact is, however, many professing Christians have never experienced the New Birth. Many have accepted Jesus Christ in a cultural sense, or may have taken up Christianity as a good philosophy to live by... a regimen of morality to follow. They may have also joined a church or engaged themselves in acts of religious service or sacrifice. These are all good things, and can possibly lead toward what we're talking about... but are not in themselves the New Birth. Nothing can substitute for this New Birth. It is a real and personal relationship with Jesus Christ that changes everything. He fills the empty void in our soul and puts joy, peace and strength in our heart. Without this intimacy of His fellowship, persons will never be able to experience that remarkable peace or rise above spiritual issues or problems. Nor can they have the assurance of salvation and eternal life. Religion cannot do any of this... only a personal relationship with Christ can. As strange as it may sound, many have even gone as far as even entering into ministry without the New Birth. Just imagine... to be convinced that Christianity is the correct philosophy, insomuch that you wish to preach it and serve as a clergyman, and yet have never experienced the New Birth nor an assurance of salvation! As remarkable as this may be, it is true. There are many good and wonderful people out there, performing extraordinary acts of kindness, benevolence and religious deeds in the name of God... and have not yet experienced God's indwelling presence. In Billy Graham's autobiography, “Just As I Am,” he recounts a chat he had with a minister friend in 1981, a priest who years earlier was confronted with the question of whether or not he had experienced the New Birth. Graham was in Poland at the time to receive an honorary doctoral degree from a seminary, and his conversation took place during the dinner that followed. Such was the similar experience of one of history's most famous preachers and scholars, John Wesley (1703-1791), whose ministry and teachings eventually resulted in the formation of the great Methodist Church. By Wesley's own confession, he did not possess an assurance of his salvation until long “after” he had been ordained into ministry, and “after” he had pastored a failed missions church in America for nearly two years. Wesley was raised in a religious home in North Lincolnshire, England. His father, Samuel, was an Anglican priest, and together with his wife, Susanna, they faithfully taught religion and morals to their 19 children. Following in his father's footsteps, Wesley likewise prepared himself to become a Anglican cleric, and while attending Oxford in preparation for his ordination, he joined a society founded by his brother Charles. Members of this "holy club" as some called it, devoted themselves to a moral holy lifestyle, daily bible study and prayer, and other pious acts such as visiting persons in prison. When he left Oxford, Wesley sailed to Savannah, Georgia... to pastor a missions church of British colonists, taking with him the ideas of the "holy club" to preach. Arriving in February 1736, he spent 1 year and 9 months in ministry, however the church rejected his teachings and ministry, and Wesley returned to England wounded and discouraged. Back in England, Wesley underwent a time of reflection regarding his failed mission, trying to find the answers to what was missing from his life and ministry. Thinking back to his voyage to Georgia nearly three years earlier, he recalled his fear of dying during a violent storm they experienced at sea... and a subsequent conversation he had with a fellow passenger, Rev. Spangenberg, a German Morovian pastor. Wesley was amazed that Spangenberg and his missionary traveling companions exhibited a remarkable peace without any apparent fear of death. So curious was he, that Wesley later asked the pastor, how they could find such composure and serenity in the face of death. During that conversation, it became obvious to both men that Wesley could not affirm even the most basic question of a Christian life... whether or not he was saved. Although he had been raised to know the scriptures, had studied theology at Oxford, had devoted himself to pious acts of prayer, Bible study, moral living... and as an ordained Anglican minister had even traveled abroad as a missionary... he and the pastor knew that he was lacking. He did not have the peace or assurance of salvation. Yes, born again believers may sometimes struggle with weakness in their faith, to actually question the validity of their salvation. But can a person be born again of God's Spirit without knowing it? I really don't think so! What Wesley experienced was the “witness” that Spangenbreg had inquired about previously, as the scripture describes, “The Spirit Himself bears witness with our spirit that we are children of God” (Romans 8:16). The results brought about an astonishing change in Wesley's life and ministry, who subsequently became one of history's greatest preachers and Christian leaders. What about you... do you know Jesus... for real? No, it's not a question of whether you believe that Jesus once lived, was a great teacher... or whether you believe that Christianity is the right religion. Nor is it a matter if you go to church, perform religious acts, or live a good and decent life. The question is, are you born again? Do you have the “witness” of God's Spirit in your heart, like John Wesley finally experienced... or that the monsignor that Billy Graham described? Have you experienced what the Apostle Paul described as “old things passed away, and all things become new?” Do you you know absolutely sure, that if you were to die at this very moment, you would go to heaven and spend eternity with the Lord Jesus Christ? If your answer is no, maybe, not sure... or anything other than an absolute resounding yes... then I ask you to do what the priest did. Review the scriptures for yourself, fall to your knees and ask Jesus to come in to your heart. Just as Wesley did, by faith, trust Christ completely as your Lord and Savior... and allow your heart likewise, to be “strangely warmed” by the New Birth of His indwelling Spirit. No, I'm not in the business of trying to make anyone doubt their salvation... nor am I in a position to question the contents of anyone's heart, which God alone knows. But I am saying only what scripture says, that "if anyone does not have the Spirit of Christ, he is not His" (Romans 8:9), AND if anyone DOES have the indwelling of Christ's Spirit, It (He) will "bear witness with our spirit that we are children of God!" (Romans 8:16). Or perhaps you once gave your heart to the Lord Jesus in the past, experiencing the joy and peace of His presence long ago... but over time, you grew distant and did not continue to follow Jesus with your life. For you, the remedy is the same... come back to Jesus with faith and repentance and let Him renew your heart and life with His Spirit again! His love and forgiveness is as much available to you! “If we confess our sins, He is faithful and just to forgive us our sins and to cleanse us from all unrighteousness” (1 John 1:9). Some may quibble over the semantics here, claiming, “Even though I'm not living for God the way I should anymore, I was already saved in the past... and I still believe in Jesus... and certainly don't need to get saved all over again!” I can agree in-part with such contention, however if a person is so far out of divine fellowship that God is unable to influence one's morality or the way they live... do they really want to assume that He will exercise a greater influence over their soul after they are dead? Think about it. Regardless whether a person calls themselves a Christian, if they reject any attempt to follow their Savior, and instead, live a life surrendered to the desires of sin and the Devil, I find it inconsistent with scripture to believe that they will open their eyes in Heaven when they die. I've said many times, “God has a greater grip on us than any of us have on Him” ... but it would be very foolish for anyone to gamble with their soul, thinking they can depart from the faith, principles and lifestyle of their Lord Jesus, and still be assured of Heaven. As the Lord said through the prophet Azariah to God's people, “The Lord is with you while you are with Him. If you seek Him, He will be found by you; but if you forsake Him, He will forsake you” (2 Chronicles 15:2). When it comes time for you to take your last breath on this earth, I don't think you want to risk the possibility of unexpected surprises when you open your eyes on other side. Don't gamble with your soul. Now is the time, while you have opportunity, to come back to a place of renewed faith and repentance... and like in the story of the prodigal son (Luke 15:11-24), the Lord Jesus is eager to forgive, to love you and rekindle your fellowship again! God's Word says, “Behold, now is the accepted time; behold, now is the day of salvation” (2 Corinthians 6:2). The most important thing to realize is that God loves you and wants to save you and have fellowship with you, but there's something that separates you from God... sin. Sin is often thought of as some vile or immoral act, but the Bible helps us understand that it is much more... it is actually an attitude of rebellion against the ideals of God, intrinsic to our inherited human nature. In other words, it is the nature for all human beings to think, do or say things that violate God's holy standards. According to scripture, this is a condition that was passed down to all the ancestors of Adam, the first man... who allowed sin to alienate himself from God's presence, and which continues to obstruct man's fellowship from the Lord today. The Bible says, “For all have sinned and fall short of the glory of God” (Romans 3:23). Not only does sin separate us from God in our present time, but it also maintains that separation beyond the grave... in a dreadful realm of eternal death and darkness that was never intended for mankind. The Bible says that the Lake of Fire was created as a place of everlasting punishment for the Devil and his angels, who sinned and rebelled against God, and were expelled from Heaven long ago. Unfortunately, this Hellish place will also be the shared destination of all those who remain separated from God when they face death. “And anyone not found written in the Book of Life was cast into the lake of fire “Revelation 20:15). However, the great news is, rather than to abandon the fallen sinful human creatures that God originally created for His fellowship, God loved mankind so much that He devised a plan to redeem us, giving everyone an opportunity to make a choice... either to continue in sin and apart from God... or to turn to the Lord, receive His offer of forgiveness and walk in His fellowship. A relationship with the Lord brings new spiritual life and assurance of everlasting life with the Lord in Heaven when we die. To implement His plan for redemption, however, God also had to find a way to comply with His own righteous standards by fulfilling His law of sin and death. In other words, according to God's values, death is an irrevocable consequence of sin that must be satisfied.... so in order to rescue man from death without violating His own principles, He found an alternate means to fulfill the demands of His law... by sending His son, Jesus, to die in our place. “For the wages of sin is death, but the gift of God is eternal life in Christ Jesus our Lord” (Romans 6:23). The only sacrifice acceptable to fulfill this enormous debt in behalf of every man, woman and child on the earth, required a perfect, sinless sacrifice. Jesus, the son of God, was the only one who could take our place, since He is the only man without sin to ever walk on the earth. So, God makes this amazing offer of forgiveness and salvation available as a free gift to every person, if they will comply with just one thing: To believe on the Lord Jesus Christ. “For God so loved the world that He gave His only begotten Son, that whoever believes in Him should not perish but have everlasting life” (John 3:16). To believe on Him means that by faith we accept that Jesus was indeed God's son, who came and died in our behalf on the cross, rose from the dead on the third day, and was exalted by the Heavenly Father as both our Savior and Lord. The instant you acknowledge this reality in your heart and confess Jesus as your Lord and Savior, something extraordinary occurs... in fact, it is miraculous. The Spirit of Christ is born in your heart and you become a habitation of the Lord's presence. Becoming born-again brings new spiritual life, and God's promise of salvation and everlasting life. The Lord receives you as His child and He writes your name in the Lamb's Book of Life. “Rejoice because your names are written in heaven" (Luke 10:20). So are you ready to accept this gift of salvation that Jesus offers you right now? The scripture says, “If you confess with your mouth the Lord Jesus and believe in your heart that God has raised Him from the dead, you will be saved. For with the heart one believes unto righteousness, and with the mouth confession is made unto salvation” (Romans 10:9-10). The very moment you sincerely express this prayer to Christ in faith, He will enter your heart by His Spirit. You may or may "not" sense anything different at first... but don't be too concerned with that right now. Sooner or later you will eventually sense His inner peace, joy and presence along with other encouraging things... but for the moment, simply trust in His promise by faith. Jesus assured that at the moment you call out for the Lord to come into your heart, He will. He promised to save you, to forgive "all" your sins, and to write your name in His book of Life. Trust Him, and by faith thank Him for doing what He promised. Now it's important to open and read the Bible each day to see what God has to say to you (start in the New Testament book of John)... and is equally important to talk to Him daily through prayer. Ask Him to guide your life and to fill you with the fullness His Holy Spirit. Get involved with a good Bible-believing church and attend faithfully. Ask to be baptized in water at your earliest convenience, in obedience to what Lord commanded (Acts 2:38), and by all means continue to live your life daily for the Lord! If reading this has inspired you to accept Jesus Christ into your heart, please let us know... so we can be praying for you. Click here to send your message. This article (VL-176) is copyrighted © by Dr. Dale A. Robbins, 1990-2019 and is a publication of Victorious Publications, Grass Valley, CA - Nashville, TN. Unless otherwise stated, all scripture references were taken from The New King James Bible, © Thomas Nelson Inc., 1982. You may download this article for personal use as long as you retain credit to the author. Obtain permission before reproducing copies for any reason, by filling out our simple use permission form. Many of our writings are also available as free pdf tri-fold pamphlets, which can be downloaded for reproduction from our Online Catalog. For media reproduction rights, or to obtain quantities of this title in other formats, email us. If you have appreciated these online materials, help us reach the world with the Gospel by considering a monthly or one-time tax-deductable donation.